Pixils are custom made-to-order social media filters for Snapchat, Instagram and Facebook. These shareable, interactive 3D filters help marketers and brands generate excitement around campaigns and track their ROI through engagement analytics. Pixils can transform users into something new, or transport them to whole new environments. They’re the ultimate social media marketing tool for viral campaigns. At AccessAR, I led the product development and creative vision of Pixils. I created the production pipeline and client onboarding system, and developed templates for team-wide use that streamline asset creation. I fielded client sales calls, created design briefs and storyboards for each AR filter, and managed a team of artists and developers to ensure quality control. 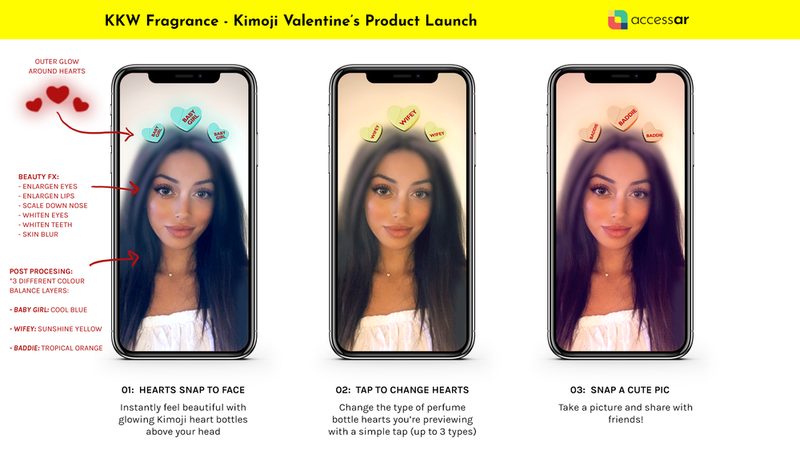 The average Snapchat user spends roughly 3 minutes per day looking at augmented reality filters, or “lenses” as Snapchat calls them. That’s a lot of dwell time that could be commercialized- if people could interact with ads, they were more likely to form an emotional attachment and respond more positively to the brand. These social platforms are designed to encourage content to go viral, in the sense that users create and share content rapidly with a wide network of friends. That meant we had to build fun and exciting filters that encouraged play and stood apart from the rest. I created storyboards that showed the pre and post-trigger animation effects of every AR filter. The below example shows how one 2D storyboard can quickly communicate to developers and 3D artists how the AR experience should play out. To try this filter for yourself, you can scan the candy heart Snapcode above to unlock it through Snapchat.